Setting up a satellite dish in London. Green Line - you have the opportunity to install a satellite dish in the area. Red Line - you can not install a satellite dish in the area. Turn the converter LNB - you need to turn the converter clockwise or vice versa. The angle of the antenna - you have to bend over and pick up the mirror satellite antenna relative to the ground. Azimut | Truthful - the value for the postponement direction protractor on the map. Azimut | Magnetic - the value for the postponement of the compass. How do you set up your own satellite dish! Our online service will allow you to customize your satellite dish on the - 255 satellites. All this is very easy to do! 1. Do you need a satellite dish itself and converter, satellite receiver - the receiver, TV cable and television itself. 2. You will need wrenches and electric drill and other tools and accessories for mounting the satellite antenna to the wall and the roof, install the antenna better in an easily accessible place where it is always easier to install and maintain in case of breakage of components. 3. You have to find a convenient place for fixing a satellite dish on the balcony wall, roof or anywhere else, the main thing that was not interference such as a large tree, a house, a wall that will prevent the ingress signal on the selected satellite to your satellite antenna (your antenna should look directly at the moon), without any interference! 4. To receive the most satellites lack a satellite dish with a diameter of 0.8 - 1.20 m, the satellite is farther away from you the larger the diameter of the antenna has to be for a more accurate calculation, see the coverage area of ​​your companion! 5. In some countries, installation of satellite antenna is prohibited without coordination with local authorities, as well as if you are renting also need to ask permission from the property owner! 6. Each satellite has open (free) channels they can watch for free, there is also a pay-TV channels to view them you need a satellite tuner - receivers a card reader and the card that must be inserted into the card reader of your satellite receiver card need to pre-register and activate itself at the service provider in accordance with the tariff plan, for example, you'll be able to watch 100 channels closed for $ 10 / month but usually for home and enough free channels are hundreds of them on each satellite, and broadcast in different languages! 7. With our online service, you can customize your satellite dish to any of the 255 satellites. To do this on the map you have to find a place where you want to install a satellite dish, choose from the list you are interested in satellite and you get options to set the antenna, which way to turn the mirror of the antenna on the map you indicate (green line) if (the red line) this means that there is no possibility of receiving your chosen companion in your city, the angle of the mirror of the antenna, turn the converter and much more. 8. After pre-configure your satellite dish according to the instructions of our service. Now connect the antenna cable to the antenna and the receiver, connect the receiver to your TV and turn them on. 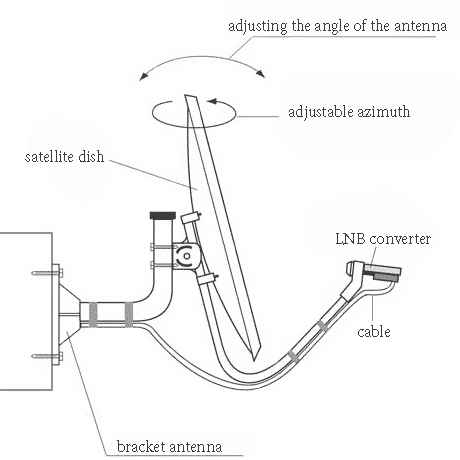 You must make an automatic search of all the channels at this satellite, after a successful search select any channel (press the INFO button on the remote satellite tuner) you should see the two scales - the signal strength and signal quality with values ​​close to zero, gradually start to rotate the mirror antenna (left, right, up, down) in steps of 0.5 cm and a delay of 5 seconds until the signal level is not more than 90%, and the quality of more than 75%, the TV shows a clear picture now all fasteners antenna should be well tighten gently but that would not bring down the settings - everything is ready, enjoy your viewing. Full list of satellites to which our service can help you set up your free satellite dish. All satellites are in geostationary orbit, its approximately 35,000 km above the equator. Each satellite orbits the planet at an angular velocity equal to the angular velocity of rotation of the Earth, and so it is always on the same point of the earth's surface. The order of the names and coordinates of 255 satellites in the table.